Chase is eliminating return and price protection on all of its credit cards. The popular Sapphire Preferred, Sapphire Reserve and Ink Business Preferred cards will lose these benefits on August 26, 2018. And price and return protection are expected to be removed from all other Chase credit cards soon thereafter. That means that you could be missing out on hundreds of dollars of savings in the near future. Check out our list of great cards that still offer these valuable protections. Before these important benefits are eliminated, let’s discuss what they are and why you should take advantage of them before they go away. Credit card issuers want you to use their credit cards for as many purchase transactions as possible. To encourage you to shop now instead of waiting until you research the price and try to find a lower one, banks offer price protection as a benefit. For example, if you buy something from Amazon, then 20 days later the price drops by $10, you would file an online claim with Chase to receive a refund for the $10 difference. Prices change on Amazon on a regular basis. I have been using Price Protection to claim reimbursement on items large and small. Recently, I received a $10 refund on an Amazon Fire Stick for the TV in my office and $2.10 on some Pokemon cards for my son. Return protection covers you when a merchant won’t accept the return. Some stores are very strict with their return policy, while others are focused on creating loyal customers by offering a more lenient return policy. Which Chase Credit Cards Are Affected? Chase is eliminating price protection and return protection on existing cards as well as new credit cards. 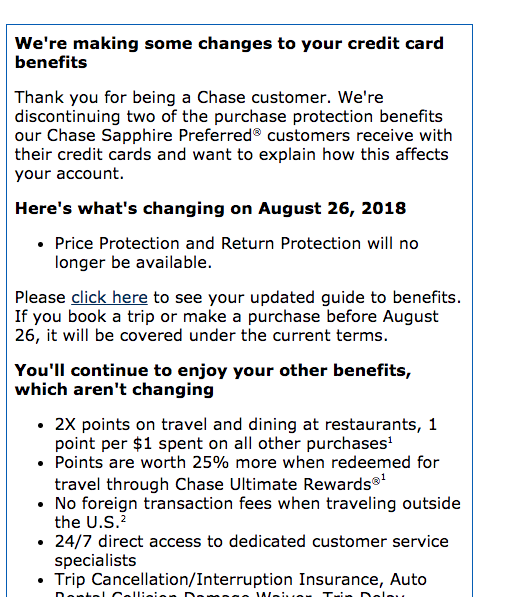 When the Chase United Explorer card was released, price protection and return protection were not offered as part of the card benefits. The legacy Chase United MileagePlus card also eliminated price protection and return protection effective June 1, 2018. And a notice was recently sent out to Chase Sapphire Preferred customers that they will lose price protection and return protection effective August 26, 2018. Cardholders of the Chase Sapphire Reserve and the Chase Ink Business Preferred received similar messages. Should You be Concerned About Losing Price Protection and Return Protection? If you haven’t been using these benefits, this change won’t affect you. But, for those of us who have been using apps like Earny (iTunes, Google) and Sift (iTunes, Google) to automatically receive refunds when prices drop, this is crushing news. Frankly, I’m really surprised that Chase would eliminate price protection and return protection from premium credit cards like the Chase Sapphire Preferred and Chase Ink Business Preferred and from new credit cards like the Chase United Explorer card. The automation from apps like Earny and Sift are just making it too easy for consumers to collect, so Chase is making a business decision to ensure these cards don’t become unprofitable. This benefit elimination is part of a worrisome trend. Premium credit cards have been cutting back on benefits recently. Before you pay for your next credit card renewal, take a look at the benefits to ensure that they are still worth what you’re paying in an annual fee. If not, it may be time to look for a better credit card that still offers these protections. Have you ever used Price Protection or Return Protection to receive a refund on a purchase? Will losing these benefits make you reconsider renewing your credit card when the annual fee is due? Which benefit is a deal-breaker for you? In other words, what is the one benefit you would cancel your credit card for if the bank eliminated it? Let us know in the comment section below.